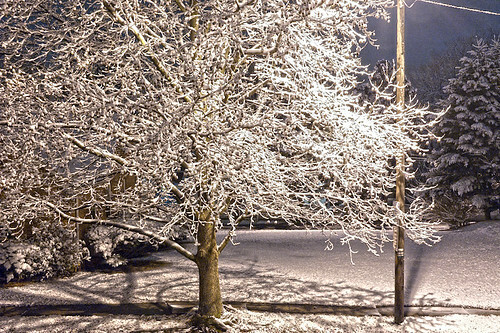 Just had the urge to open my window and take a shot of the tree across the street covered in snow. Set my Nikon D70 on the tripod, put the camera in manual and set it to bulb mode. Took a few shots at f/11 and experimented with the shutter speed. Lens correction and white balance adjustment in Adobe Lightroom, then into Photoshop for some HDR tweaking.